Note : The licence registers suggest that Bullards and S&P exchanged houses after closure. 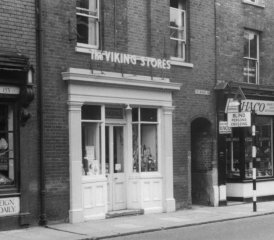 The second VIKING STORES to operate in Magdalen Street, this one from 1957 to at least early 1961. Located in the former TWO BREWERS. Morgans sales for 1960 were 28 barrels of beer, 183 spirits.